Schindele's Minerals said to be one of the great discovery of 20th Century. Germany's most famous non medical practitioner, Dr Mahfred Kohlechner, has been recommending it for several years, to those, who wish to feel younger, more energetic and healthier. Schindele’s Minerals, unadulterated, natural minerals, are produced from a stone similar to lava. It contains all minerals and trace elements necessary for healthy life. They restore and regenerate cells in the body and they are easily assimilated by human, animals and plants. Of this miracle drug Robert Schindele and many others take a spoonful every day. The drug is extracted from a quarry. Schindele's Minerals - this is simply rock ground powder! This earth can work wonders, everybody who has swallowed the stone flour is said to feel much younger and healthier. May be this is our Earth wonder gift. The German food chemist Dr. Mang wrote on this subject the following: "The Original Schindele's minerals consist of pulverized natural rock flow, with the high content of silicic acid, aluminum, potassium, iron, magnesium, as well as numerous trace elements. the mineral elements are, just like protein, fat and carbohydrates, considerably involved in the course of life process, by helping to create the physical and chemical conditions for the functioning of the cells. Mineral elements influence growth and are strongly connected with the anabolism of hormones, vitamins and enzymes. They are very important elements of bones, teeth, and special tissues. Since they are continuously exchanged and lost, they have to be given to the body regularly. Deficiency of mineral elements over a long periods are for human beings the cause of deficiency diseases. If one takes regularly the original Schindele's Minerals, the organism receives sufficient mineral elements, therefore a deficiency of mineral elements can be excluded. The original Schindele's Minerals is to be considered a "real food" which is virtually a natural substance without toxic substances." Silicic acid: is described by naturopathy as a primary substance of life. It supports the respiration of our cells, and makes sure that our cells do not age so quickly. It influences the skin, hair, nails and muscles. Moreover it stimulates the digestion. Potassium: f it is important for the supply of blood, it keeps heart going and makes the body slim. For the function of the cells, sufficient oxygen supply is certainly necessary. Iron and potassium serve best as transporters of oxygen (the center of the blood pigment, the hemoglobin consists of iron ions). Potassium can be accumulated in the body only for eight hours, and therefore has to be supplied regularly. Lack of potassium in the cardiac muscle can cause sudden death by cardiac failure, disturbances of the cardiac rhythm reduced and irregular pulse, change the ECG and cause long term damages. Lack of potassium causes colic, constipation, etc. It paralyzes the biological peristaltic movement and causes further paralysis that can spread from the neck along the body. Lack of potassium causes muscular weakness, general fatigue and decline in performance. For plants and trees potassium is vital for the protective wax layer on leaf and needles. If the protective wax layer on leaf and needles is not strong enough, pollutants can penetrate quickly and start their destructive activities. Potassium activates the elimination of water, potassium controls the pressure and the swelling in the cellular tissue. The cell can hold potassium only with the help of magnesium. This exchange of electrically charged ions is the basis for the activity of the nerves and muscular functions. Iron: it is responsible for a sufficient supply of oxygen in the blood. Lack of iron make human look pale and feel exhausted. It serves to transports the oxygen to the cells, especially to the cardiac muscles and to the brain. Lack of iron also causes disturbances of the lipid metabolism and lack of oxygen which the cell needs for the production of energy. Calcium: this element is very important for the health of our bones and our teeth. Calcium also strengthens our connective tissue, which is responsible for the youthfulness of the body. If calcium is missing, then especially women often feel lifeless, tired and nervous. As of the age of 40, calcium is anyway important for every woman. Magnesium: this mineral is of utmost importance to our heart. It protects us from overstrain and stress. 400 mg per day are sufficient. Hypertension can be normalized with potassium and magnesium. Zinc: It gets the metabolism going and strengthens the cells. If Zinc is missing the hair fall out, wounds heel badly, women cannot have babies, etc. Chromium: is one of the most important regulating metals for human beings, animals and plants. For human being and animal chromium is essential for the fat metabolism and the glucose metabolism. If the necessary quantities (~2 mg per day) of chromium are missing, this causes inevitably arteriosclerosis of the coronary vessels and diabetes. Trace elements of some metals are extremely important for human being, animal and plants. For full analysis see minerals and trace elements. take 1 (one) teaspoonful in the morning or in the evening, drink thereafter a lot of water, or milk, or any other liquid. It can be taken in the morning and in the evening. It can be made into effective skin cream by mixing well with any cream available in a ratio 1:1. This takes especially good effect against the formation of wrinkles in the face. Mix all ingredients well, apply on well cleaned face and neck. Let it stay for 10-20 minutes, then wash of with a lot of cold water. The treatment can be repeated 1- 2 times a week. Add 500g Schindele's Minerals to the bath. While bathing the bath water should be stirred several times. The bathing time should be ca.1/2 hour. It is excellent treatment for rheumatic pain and fatigue, it regenerates the body, improves the general well-being, and also lifts the skin. 10g per day per 70 kg live weight. 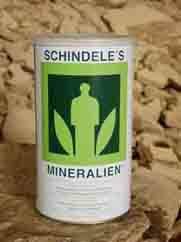 By adding Schindele's Minerals to the food the fitness of riding horses and other animals is stimulated. 2 x per year spread one heaped teaspoon over the garden mould, add lots of water.